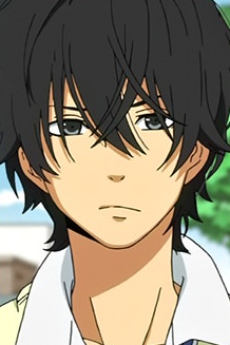 Birthday: April 2 Height: 178cm Haru is the male protagonist of the story. He is a high school student who sits next to Shizuku in class. He is a delinquent boy who is absent for a long time after getting in a fight early in the story. Despite being a trouble maker, he is a passionate boy who helps others and can achieve high grades with little effort. He does not like going to school because most people see him as a threat and are afraid of him, saddening him as he is unable to make real friends. After meeting Shizuku, he takes her as his first real friend and starts to attend school, falling in love with her in the process. He also keeps a rooster and brings it to school everyday, despite his teacher's disapproval. He has somewhat of a perverted mind, openly saying to Shizuku that he would "do" her and has "dirty thoughts" about her. It is unclear whether or not he actually thinks before he speaks. At first, Haru was shown to be a delinquent, but as the story unfolds, it was revealed that he was rather a shy and innocent boy. However, he has bipolar tendencies, most likely the result of not interacting with many people in the past.